The summer after Joss failed to kill the vampire Vladimir Tod, he gets a second chance to prove himself as a Slayer. He is sent to New York City to hunt down a serial killer that the Slayer Society believes is a vampire. 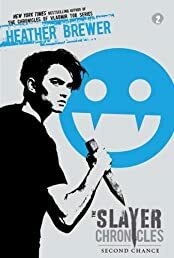 It is up to Joss to lead his Slayer team, and through their detective work, they discover that there are actually four vampire brothers who are on the killing rampage. Joss must use all his skill to save the innocent people of New York City from the murderers. Joss's status as a Slayer depends on it. The Slayer Chronicles can be read alongside The Chronicles of Vladimir Tod or entirely on their own. This second installment gives readers even more insight into the nightmares that drive Joss the Slayer.